Welcome to my website where you can find information about my latest projects, news, and upcoming events. As part of my Ph.D. I am writing a new poetry collection about my experience of mothering . So far, the collection’s throughlines are concerned with maternal psychological and physical transformation within the praxis of mothering. My accompanying study has meant I’ve been able to meet and research with some wonderful organisations, most notably the Museum of Motherhood in Florida (see below for further information on my residency), Procreate and their excellent Oxytocin conference, and viewed the much-needed Birth Rites exhibition. These organisations have truly inspired and informed my work. The Otter Gallery is currently under threat from closure. I believe this is a mistake as many of its artworks will be under threat from theft and damage. To find out more and sign a petition to save the Otter Gallery, please click here. On Wednesday 2 May 2018 7.30pm I will be reading from my debut pamphlet Bloodlines at Open Mic Poetry at the Jubilee Hall, New Park Centre, Chichester. Poet, Mandy Pannett will also read from her extensive back catalogue. There will also be an open mic. This event forms part of the South Downs Poetry Festival 2018. To find out more about Chichester Poetry click here, and for the South Downs Poetry Festival programme click here. Great news! 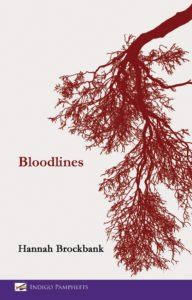 My debut pamphlet, Bloodlines is now available to order here. Bloodlines is a collection of poems that explore a woman’s experience of growing up without a father. The collection is chronologically arranged, beginning in childhood and continuing into adulthood. Bloodlines engages with themes of loss, abandonment, memory, landscape, cultural disinheritance, and biological inheritance. Between the 23rd October – 6th November, I researched and wrote at the Museum of Motherhood (MOM) in St.Petersburg, Florida. During my residency, I responded creatively to MOM’s wealth of exhibits and art which incorporated a range of mothering concepts, and inspired me to embody my own matrifocal experience through poetry. To find out more about my activities during my residency at MOM, follow me on Twitter @hannahbrockbank or on Instagram @hannahbrockbankwriter . To find out more about MOM, click here.